Before I found this recipe, pie crust – and really pies in general, had been my nemesis. Jon prefers pie over cake. So I tried, God I tried. But I always had issues with the dough splitting and cracking, or not rolling out evenly. Not to mention my rolling skills weren’t the best to begin with. But I knew that pie crust was something that I had to get the hang of, so I soldiered on and finally came across this recipe from Annie. Couldn’t be simpler! There’s no funny techniques or weird ingredients (I’m looking at you, vodka) to worry about. It’s made in the stand mixer, which is always a plus – the paddle attachment breaks up the butter pieces as a pastry cutter would do. A little chilling period in the refrigerator to firm it up before rolling out, and then voila – a pie crust that rolls out beautifully, and it still sturdy enough to work with to get in the pan and get your crimping done. Not to mention it’s always perfectly tender and flaky as well…everything that a pie crust should be! I’ve used this recipe for pies that require a blind bake (for something like this Cherry Cheese Pie, where you need a baked pie shell, but the pie-filling doesn’t need to be cooked) or for something like Ricotta-Pineapple Pie, where the whole pie needs to go in the oven to bake. In either even, it always turns out beautifully. 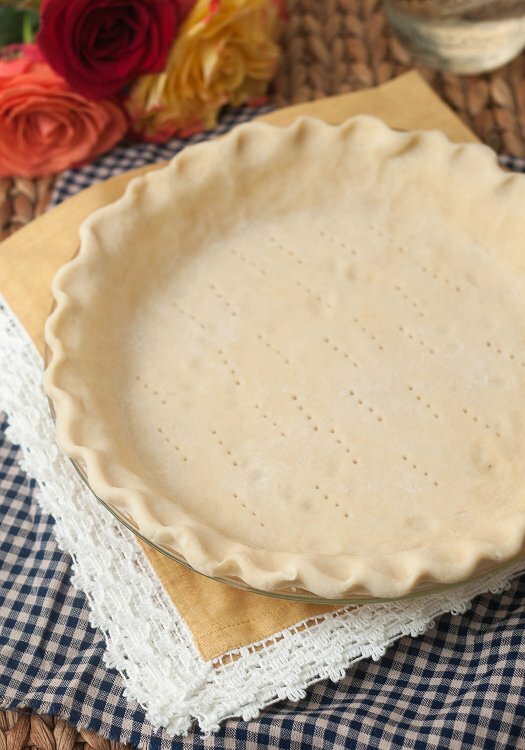 If you too have struggled with pie crusts in the past, give this recipe a try. It really was a lifesaver for me, and now I’m so proud of my many pie accomplishments in the kitchen! Shape the dough into a ball, wrap in plastic wrap and chill in the refrigerator for at least 30 minutes. Remove from the refrigerator and let sit for 10 minutes . Roll out the dough on a lightly floured work surface. Use as directed in your desired pie recipe. Thanks for the great recipe, it’s always nice to have a simple and fast recipe for pie crust. I like vodka any way I can get it. I’d hate to waste it in a pie crust though! my mom made great pie crusts. my husband learned the tricks from her. cold water, refrigerate and handle as little as possible. don’t think her recipe has sugar in it. Gorgeous pie crust! I am guilty of not refrigerating my pie crusts enough. Glad to hear that this recipe is a winner – I will have to try it the next time! I haven’t made pie crust before. Is it safe to assume that this makes only a single pie crust? Can I go ahead and double the recipe, or is it better to make one crust at a time? Yes, it’s for a single pie crust. I’ve doubled it for a covered pie before and it worked nicely! I don’t see how the cold butter is supposed to break into small pieces in the stand mixer. It’s been going in my stand mixer for a while now and at best, it’s flattening out into discs up to the sizes of quarters. I think I’ll stick to using a food processor for pie crusts. Charmaine, sounds like you need to readjust your mixer. It’s not sitting low enough in the bowl.